When my son was a baby, I remember wondering what sort of activities I could do with him, especially before he was mobile. He wasn’t old enough for traditional arts and crafts or play time fun. I spent quite a bit of time being creative and browsing Pinterest back in those days. 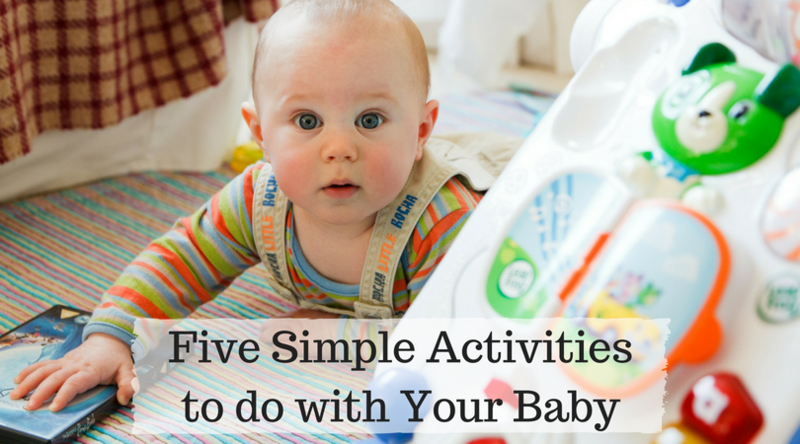 Today, I’m sharing just a few of my favorite activities to do with a baby. Books are a great option at any age! When it comes to babies, there are a few different ways that you can use books. There’s the most obvious way – read to your baby. I’m a firm believer that introducing books young is important. We introduced books when my son was maybe a month old and now at sixteen months, he’s obsessed with books. Another great way to use books is as a focal point during tummy time. When my son was little, we used to prop him up with the boppy during tummy time. We would then place a book in front of him and turn the pages for him. We found that this made for a less fussy tummy time experience for everyone. Language development starts when we’re a baby. Even though babies can’t talk back to us, they are still able to take in all the we’re saying and communicating to them. They’re in a constant state of learning and simply talking to them can help their language development in so many ways. You may feel a bit silly talking to your baby, but it’s a great thing to do for both you and your little one. If you’re unsure what to say to them, then simply start by describing what you’re going to do. “We’re going to the nursery to change your diaper.” It may not seem like much, but it’s a step forward in the world of learning and language development for your little one. Songs can be fun at any age! This one is very similar to talking since it’s another way to jumpstart your child’s language development. Songs can also be distracting and soothing to a baby when they’re in a fussy period. So, in some cases, singing can work as a stress buster as well. They can also make mundane tasks like changing a diaper a bit more enjoyable for everyone. There are so many different toys out there for babies. In fact, it can be a bit overwhelming picking them out. A few simple rattles and stuffed animals will typically do in the beginning. As your baby grows, you’ll even find that he/she loves playing with everyday household objects like spatulas and bowls. When you’re picking toys, think about what your child can do with it. Does it make noise? Does it have different textures? Will it grow with your child? I’ll be sharing more on picking out toys in a future post, but I recommend looking at how your baby might be able to interact with the toys you pick out for them. Walks are beneficial for parent and baby in so many ways! The parent is able to get some much needed exercise, while baby is able to see new sights and take in the world. We also found that exposing our little one to walks and events early has helped as he grows. We are constantly out exploring the world around us and he now enjoys it just as much as we do. Walks can be calming for the parent because you’re getting out of the house. They can also be soothing for baby and even put him/her to sleep. You can walk around the neighborhood or take a trip out and go shopping. There are going to be times when your baby isn’t too happy about being in the stroller (remember – your baby is a unique individual after all) but the practice is good for everyone. Remember that every parent has dealt with a fussy baby out in public at some point or another. There’s no need to get embarrassed. These are just a few of my favorite activities from when my son was young. Find the activities that make you happy and that happiness will likely rub off on your little one just a bit. I’d love to hear your thoughts in the comments below. What are your favorite activities to do with a baby?